In 1877 Taneev wrote his Symphony No 2 (unfinished). By the end of that year the first movement of the symphony was performed at the pre-concert rehearsal under conductorship of Nikolai Rubinstein. The public performance was unsuccessful. Apparently because of that Taneev did not come back to it. However the whole content of the symphony was discussed in the course of studies with Tchaikovsky. In 1974 composer Vladimir Blok after thorough examining the rough copies completed it. The composition represents an attempt to create an epic Russian symphony. One can identify some evident prototypes of it. For instance an elegiac yet rigorous introduction to the first movement echoes the first theme of Tchaikovsky Romeo and Juliet overture. The first movement (probably the best one, Tchaikovsky thought highly of it) outlines a contrast of a resolute approach and lyrical mood. Later on Glazunov developed this intonation, in particular in his famous Symphony No 5. 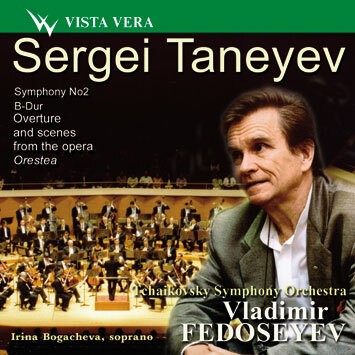 In 1882 Taneev conceived the idea of writing an opera in three parts, Orestea, based on Eshil's trilogy. Twelve years passed between the intention and its completion. At the time of extravagant styles and plots Taneev found his ideal in an ancient Greek tragedy with its exalted noble philosophically generalized passions but also in the art of opera of the past, in particular that by Gluck. However the result was that most of the critics unanimously rejected the composition. They described it as "affected anachronism", "academic horror" and so forth. Paradoxically as it may seem Taneyev, while struggling against the current, forestalled a turn towards the antiquity and oratorio style in the XXth century music (Stravinsky, Honegger, and Milhaud). Most popular symphonic fragments of the opera, a large-scale overture and Interlude to scene 2 of act 3 ("Apollo temple in Delphi") are unified by the theme of Apollo. The Interlude was a great success at the premier performance of the opera on October 17, 1895, in St. Petersburg. A majestic scene is conveyed by the means of marvelous contrasts of brass instruments and string instruments and harp.